I’ve been a little slow-moving this week due to coming down with hay fever. I woke up on the first day of Spring with itchy/watery eyes, runny nose, and lots of sneezing. 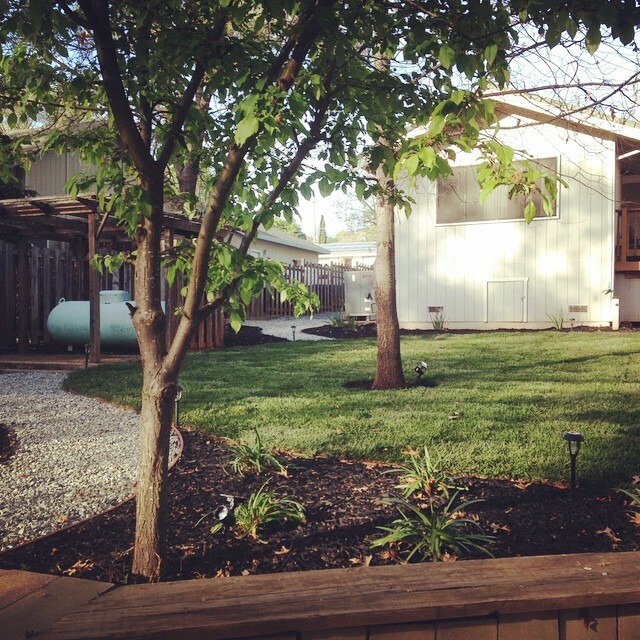 Aside from that, I am pleased to announce that the backyard is finally done! I’ll have a full reveal post on Monday! 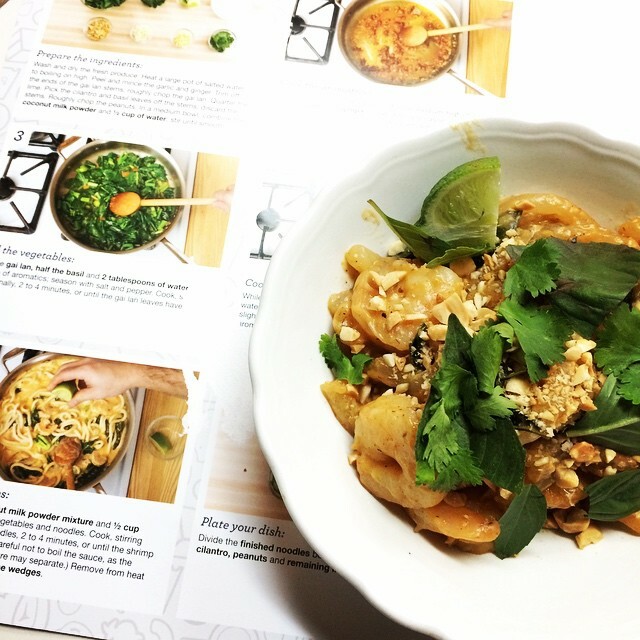 I also tried my very first week of Blue Apron! For $59.95/week you get all the fresh ingredients delivered to your doorstep to create three delicious meals enough to serve two people. It’s great for someone like me who a lot of times gets home from work too tired to think about what to make for dinner and will resort to eating out. This service allows us both to get in the kitchen and make a meal without really having to think about it. It’s affordable, easy, and we get to try something new each week. 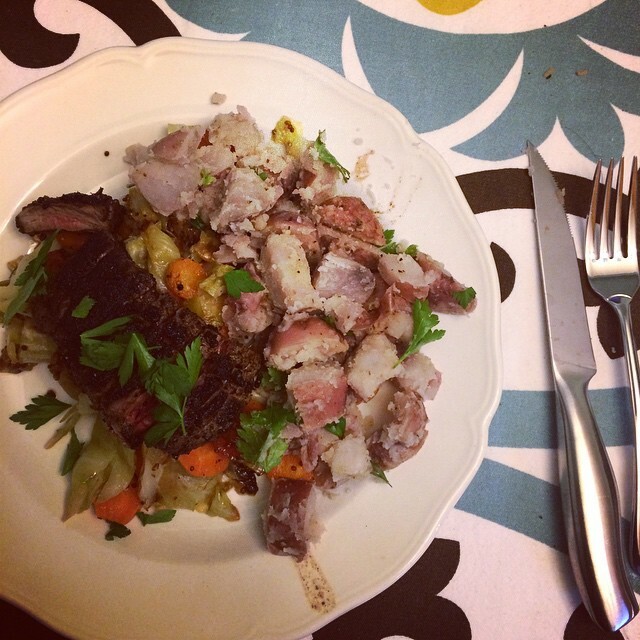 Corned Beef-Spiced Flank Steaks with Braised Cabbage & Buttered Red Potatoes – I’ve never cooked cabbage before, so this was a yummy new experience. I had to be careful about not overcooking the flank steaks too much, but they turned out great. For my first meal on this plan it was really easy tasted great! 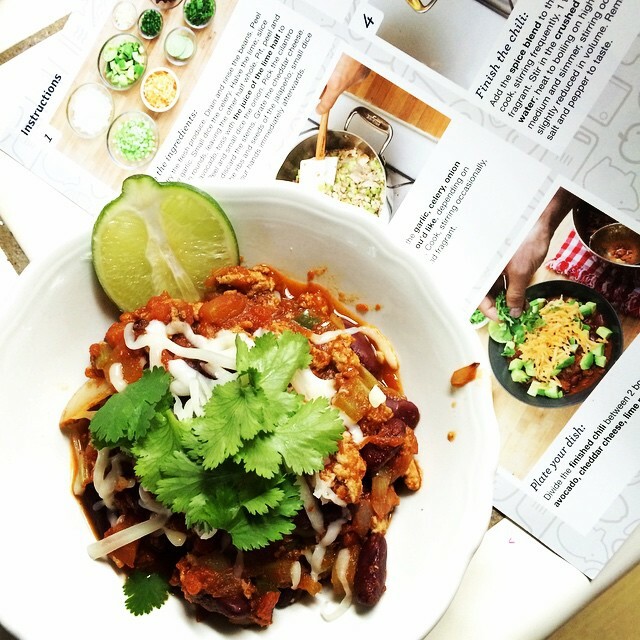 Turkey Chili with Avocado & Cheddar Cheese – We put the whole jalapeño in, and boy it was SPICY! Had to add a few spoonfuls of sour cream to cool it off. I accidentally forgot to put the cheddar cheese in the fridge when the delivery arrived, so my cheese went bad; instead I used a shredded jack mix I had on hand in the fridge. I don’t like avocado, so I didn’t have any on mine but my sister and Joshua put it on theirs. It was really yummy, just next time we won’t put in as much jalapeño. Tom Yum-Style Shrimp & Noodles with Gai Lan & Thai Basil – I’ve never made a dish like this before, especially with so many ingredients I’ve never heard of, but now after making with the help of this service I’m confident I could make it again with a trip to my local international market. It had just the right kick to it, and it make three heaping servings. Today my next delivery shows up, so I’m looking forward to planning out my meals this week! I launched a site this week! I’ve been managing the redesign of CGA for quite some time now, and Thursday evening the site FINALLY went live! I’m so pleased with how it turned out! Aside from the launch, I’ve began working on the design for their annual conference site. Every year they have a different theme, so we have to design a splash page and site design. I should have the splash page up in a week or two followed by the full design in May. I made a lot of progress this week! I began importing over posts from here to The Lovely Geek and organizing them as well as installing the Bones theme, setting up the rest of my pages, and configuring my menu. Since I’ve been working on designs at work it has put me in design mode for this site, so I’m excited to move into that phase.